THE SCRN OR SCREEN COFFEE TABLE FEATURES A SAPELE WOOD TOP, WALNUT SCREENS AND A GREY POWDER COATED METAL BASE. THIS SIMPLE DESIGN COFFEE TABLE ACCENTUATES THE BEAUTIFUL HAWAIIAN KOA WOOD. GREY POWDER COATED METAL BASE WITH MATCHING KOA FEET. WE USED OUR LODO DESIGN TEMPLATE TO CREATE A FLOWING PATTERN THAT WATERFALLS OFF THE TOP INTO OUR FLOATING CUTOUT WALNUT SCREENS. 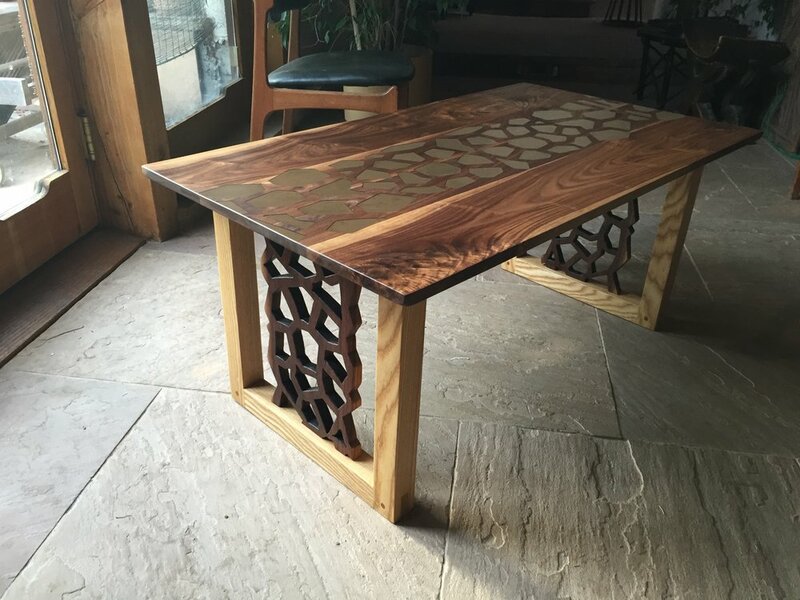 THE CUTOUT PATTERN ON THE WALNUT TABLE TOP IS FILLED WITH A MATTE BRONZE POWDER RESIN. THE ASH BASE AND LEGS ARE CONSTRUCTED USING BRIDLE JOINTS THAT ARE REINFORCED WITH OAK DOWELS.